Successful teamwork is often the path to a successful dental practice. If you have gone through the effort to carefully interview and find the best employees for your dental practice, it is important to make an effort to retain them. High turnover is not only frustrating but costly. After all, it takes time and resources to train new employees! When you retain a good dental practice staff your patients will be happy to consistently see the same faces at each appointment, and your practice will be far more successful. Below are some tips for improving your dental practice employee retention. Improving your dental practice retention rate begins with hiring the right employees. When crafting a job description, it is important to strategically craft it to emphasize your practice priorities. Further, strategically interview potential employees to determine whether they tend to be loyal. Ask what their 5 year plan is. If they say they plan to go back to school in the next year or plan to move out of state you know that it is unlikely that you will be able to retain that employee for the long run. Though interviewing can be trying, don’t rush the process or compromise because hiring the right person for your unique practice matters when it comes to retention. Employees often become frustrated and consider leaving a job when they feel their concerns are not being heard or they have frustration about certain procedures. By consistently meeting with employees both individually and in staff meetings, it gives an opportunity for staff to discuss concerns as well as an opportunity to praise positive things that employees have done. If your dental practice does not have good health benefits it is unlikely you will retain an employee for the long-term because at various stages in life they will need quality health care and they do not want to have to pay an arm and a leg for it. Even if they love your practice, they may consider leaving because you do not have good health benefits. Show your employees you care about their health by offering good health benefits. Every dental practice is different – some are routine and procedure driven with very little staff fraternizing. Other practices have a very fun atmosphere. 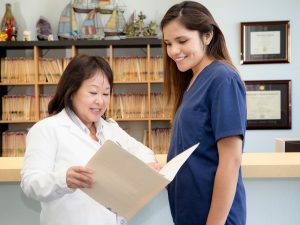 It is important to set your expectations for staff from the outset and only hire employees that want to be a part of your particular dental practice culture. Everyone loves to have their work appreciated. Show consistent appreciation to your employees for doing a good job, following procedures, or providing outstanding patient care. Consider implementing an “employee of the month” award that comes with some sort of incentive such as movie tickets to encourage the best out of your employees. Don’t forget to show appreciation for specific things rather than fake praise that seems disingenuous. Previous Post« Previous Hygiene Hires are Here!